With addiction and recovery getting more national exposure than ever before, we pause on September 20, 2018 to celebrate vital players of the health system and continuum of care - addiction professionals. National Addiction Professionals Day will be celebrated on September 20, 2018, as part of National Recovery Month. 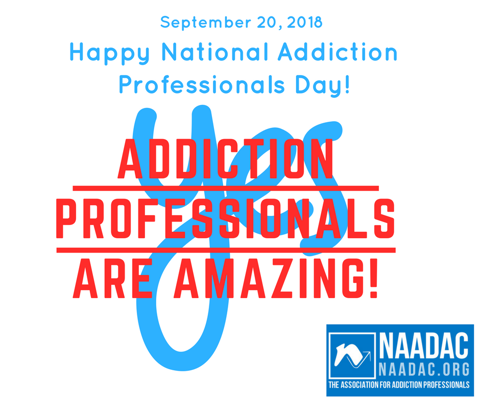 Started by NAADAC, the Association for Addiction Professionals in 1992, the day was established to commemorate the hard work that addiction professionals do on a daily basis. NAADAC is the largest membership organization for addiction-focused healthcare professionals and represents the professional interests of more than 100,000 addiction counselors, educators and other addiction-focused health care professionals in the United States, Canada and abroad. "We welcome everyone to join us on September 20, or hold their own local event, to celebrate the powerful work that addiction services professionals do. As each life is recovered, that helps the whole family and eventually translates into the recovery of a community," said Cynthia Moreno Tuohy, NCAC II, CDC III, SAP, NAADAC Executive Director. To celebrate the day, NAADAC will announce its 2018 Award winners. These dedicated addiction professionals and organizations will be honored in the Fall issue of NAADAC's Advances in Addiction & Recovery magazine and at the President's Awards Luncheon at the 2018 NAADAC Annual Conference, being held in Houston, TX from October 5-10th. National Addiction Professionals Day is held in September as a part of National Recovery Month. Sponsored by the Substance Abuse and Mental Health Services Administration (SAMHSA), National Recovery Month aims to increase awareness and understanding of mental health and substance use disorders and celebrate people in recovery. In addition to celebrating National Addiction Professionals Day, NAADAC has celebrated National Recovery Month through the hosting of two webinars on the retention and recruitment of addiction professionals and four regional workforce forums for college students to bring greater awareness of the opportunities available in the addiction profession. Download the 2018 National Addiction Professional Day Partner Marketing Kit for information about the day that you can include in newsletters or other mailings, as well as sample social media posts and graphics. We encourage you to acknowledge and celebrate the day! For more information on Recovery Month, please visit www.recoverymonth.gov.